Figure 2-24. 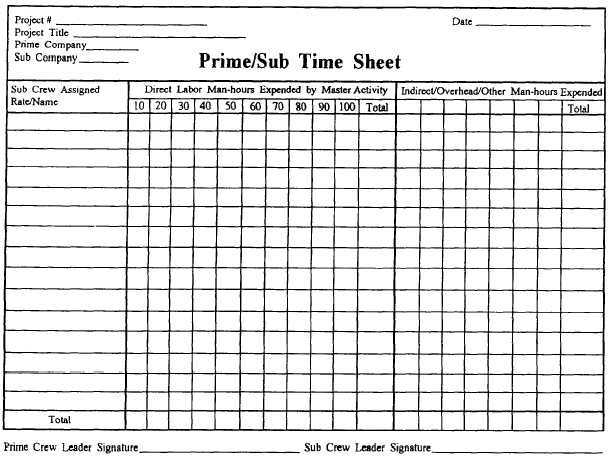 - Prime/sub timesheet. operations, military operations and readiness, disaster recovery operations, and training. Direct labor includes all man-days expended directly on assigned construction activity, either in the field or in the shop. Direct labor also includes any labor that contributes directly to the completion of the project. Direct labor must be reported separately for each assigned master activity. Indirect labor is man-days expended to support construction operations, but that does not produce an end product in itself. Equipment maintenance and production of shop drawings are examples of indirect labor. Overhead labor is man-days expended that must be performed regardless of the assigned mission. Military operations and readiness are man-days expended in actual military operations and unit embarkation. Operations and readiness man-days also include any planning and preparation necessary to ensure unit military and mobility readiness. Disaster recovery operations is man-days actually expended during disaster recovery operations.